Current RMS doesn't PAT test your equipment or directly integrate with PAT testers. 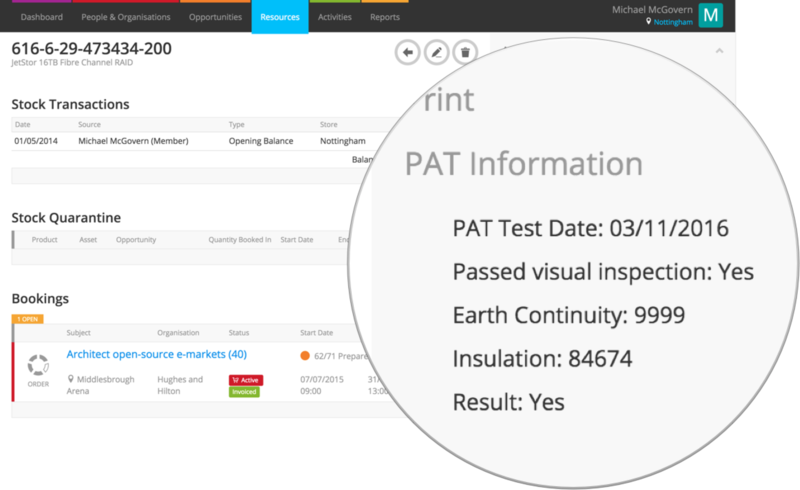 However, you can record PAT and other equipment test results in your system using custom fields. These fields can be pulled through to documents that are available to print from your opportunities or product pages. 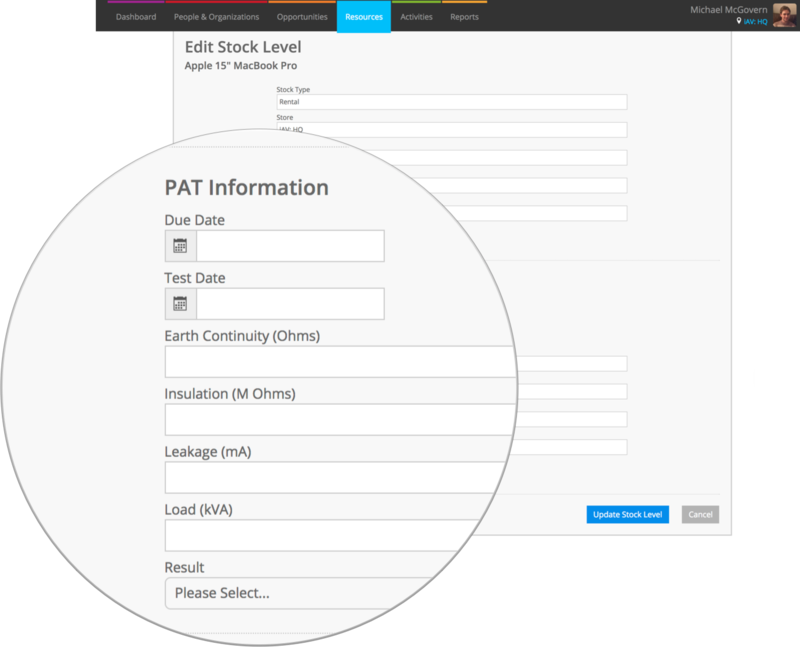 Create some custom fields to store your PAT or other equipment test results against your serialized stock levels. Add information to those fields – you can import using CSV spreadsheet. View that data in Current RMS or pull through to your document layouts. Custom fields are a way of adding your own fields to the screens in your Current RMS system. You can add text boxes, date pickers, drop down boxes, and a range of other fields. To view, all you'll need to do is click into an asset page to see the results. You can also set custom fields to show up in the stock levels view on the product page if you’d like to make them more noticeable – useful for test dates. When creating your custom fields, be sure to set the module as “Stock Level” so that these fields appear on stock level screens. Edit a stock level in Current RMS to add to your custom fields. To edit a stock level, head into a product page and click a stock level under the “Stock Levels” heading. After this, hit the pencil icon at the top. If you have lots of values to add, you’ll probably want to update all of the records at once with an import. When you set up custom field against the stock level, a column is created on the stock level export template for you. This allows you to update your PAT information en masse. Just export your stock levels to get a list of them, fill in the new test values for each product, then re-import this to Current RMS to update all of the values. This kind of setup is especially good if your testing software can export to a CSV or other kind of spreadsheet – it’s just a case of merging or copying the values from one CSV to the other. Once you’ve added these custom fields and added them to opportunities, these can be pulled onto opportunity documents. 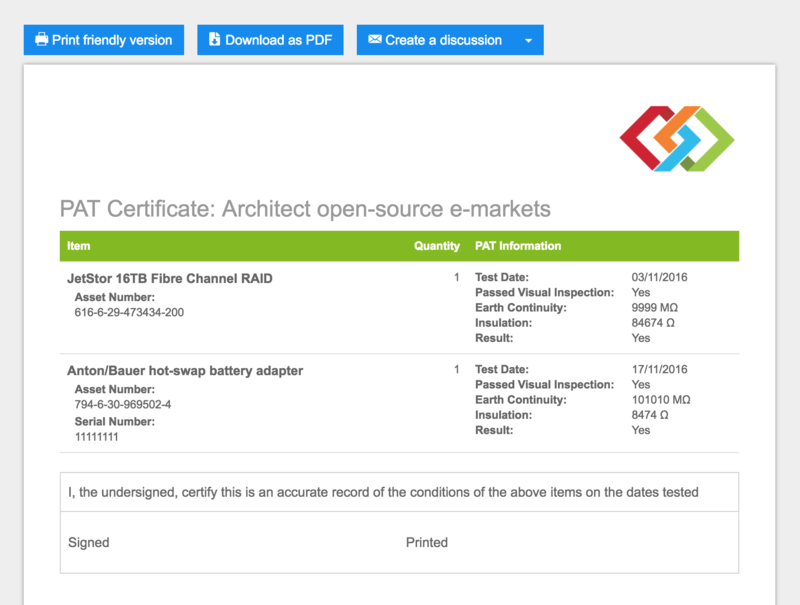 This means that once you’ve allocated assets to your job, a test document can display the test custom fields against the assets so you can send this to your customer if they require some sort of certificate. Head to System Setup > Document Layouts to start modifying your layouts.